Nestled in heart of the Old Town, this beautiful and spacious 4th floor apartment boasts 2 separate bedrooms with a separate living room making it ideal for 2 - 3 couples. 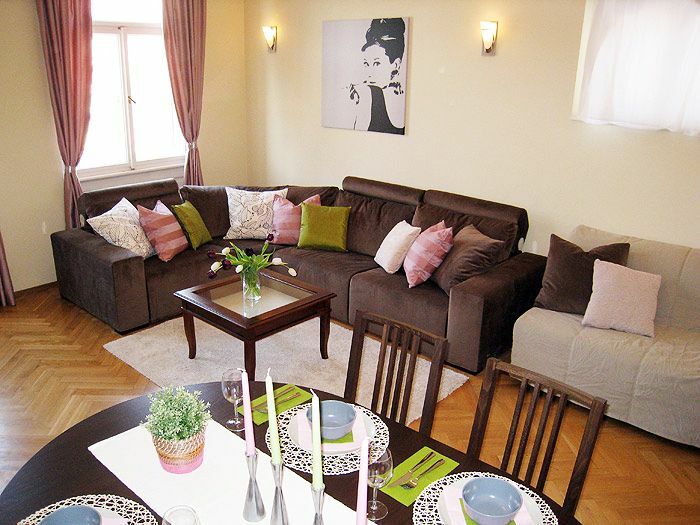 The apartment was fully renovated in January 2012, and has all new furniture. The turn-of-the-century building (1904) is in immaculate condition with restored frescas at the entrance and has a new elevator which leads up directly to your door. Have been in the real estate and travel and tourism industry for over 15 years. We pride ourselves on customer service and providing and amazing experience for anyone visiting Prague. We look forward to hosting you during your visit to Prague. Bedroom 1 is the largest with a Queen sized double bed, large wardrobe, chest of drawers and view to the Old Town rooftops and The Prague castle., The height of the apartment (4th floor) and double windows ensure quiet even at the height of tourist season., A westerly view offers great afternoon light. Havelska street is in the heart of Prague's historic Old Town. Just 200 meters from the Old Town square and the metro stop Mustek means that you have easy access to everything to see in Prague.